Our 2BD floating house, the Shanghai Lucy, is designed for relaxation in a natural, beautiful setting. It is extremely comfortable, has incredible views, and is on one the best locations on the lake. This is a floating house accessible by boat only. Two kayaks and a paddle boat may be available for use per prior arrangement with owner, but renters must have (or rent) their own boat for access to and from the Lucy. The 2nd bedroom has 2 double beds in bunk layout. The sunny, full kitchen has all accessories. The living room features a high, vaulted ceiling with antique tin ceiling, moldings and woodwork. The master bedroom also has an antique tin ceiling, moldings and woodwork as well. Both rooms have new faux hardwood floors that are warm and look great (it is difficult to put real hardwood in a floating house due to moisture). There is original artwork throughout the house. The best part about the whole house is the picture window facing the back, which has an unobstructed view of a beautiful cove and the sunset every night. Smoky Mountain 'smoke' rises in the cove every morning and after each rain. Your family can swim right off the front deck, day or night, which is partially covered/shaded and features a gas grill and a covered outdoor dining table for 6. If you don't have a motor boat, various types are available for weekly or daily rental at the nearby marina. Jet skis are available as well. You just park your boat at the front porch of the Lucy and you're home. The Lucy is located at Shanghai Resort--one of the best locations on the lake--with an outdoor/indoor, floating restaurant and bar within view and a short boat ride from the house. Situated in a quiet cove, you can literally lie in bed and look out the window at ducks on the water or families of deer or even otters on the nearby shore. The sunrise and sunset views from the house are terrific. Norris Lake is in the Cumberland Mountains, with many state parks, hiking trails and an excellent trout stream nearby. Great Smoky Mountain National Park, Gatlinburg, and Pigeon Forge are only 1.5 hours away. Minimal rental period is three nights. Renters must also pay $85 cleaning fee and $25 processing fee. Also, any rental including the 4th of July must be a for one week.. Environment at Shanghai: The Shanghai Harbor is a mellow, relaxing place. The residents grill out, swim, ski, boat, fish, etc. There are other floating houses nearby to the Lucy, so it is more like a community or village scattered around a harbor centered around the marina/restaurant/bar. The environment is appropriate for families or adults who want to enjoy relaxing in a beautiful environment. Loud partying or rowdiness late at night will lead to complaints from other residents, and possibly even expulsion by the owner of the marina. Thus, groups of 'spring breakers' or other groups wanting to get loud and blow off some steam late at night are fine for many places, but would not be a good fit for this environment. We are a family of 4 from Cincinnati, who fell in love with Norris Lake and the Shanghai Resort area, and dreamed of having our own floating house here. We rent it out only for a few weeks a year to cover some of the expenses. This is a vacation home that is truly cared for and loved by its owners (rather than owned as just an investment), because it is used by our family most of the time. We fell in love with Shanghai Resort and the cove that the resort is in. There is something about the sunrises and sunsets here. It is just so beautiful. It is rare that a floating cottage comes up for sale here at Shanghai, so when this one came up for sale, and we saw it and realized what we could do with it with renovations, we jumped at the opportunity. We have put more than $35,000 in updates into it since buying it in early 2013 and now it is completely re-done and ready to go. This floating cottage is unique in design and decorated with high-end furnishings. It is in a quiet, calm spot in the harbor. Full bath with shower, sink, medicine cabinet, etc. Door to laundry room must be left open when using dryer due to high heat levels. Two kayaks may be available per prior arrangement with owner. Please check when making reservation. We had an awesome relaxing weekend. Thanks so much Shanghai Lucy! We loved The Lucy! Such a nice vibe and as stated, has a great, responsive owner. Our only opinion would be... you definitely need your own boat. We were there at a time when many of the neighboring homes were empty, and it was harder than we thought to hitch a ride to the Lucy, and that was a must with all of our belongings. (We did rent a boat, but did not have it on arrival and had to return it the night before leaving). There is a small paddle boat, but not functional for toting 3 days worth of luggage, food, and drinks. Otherwise, for regular boaters... this is a great place to stay and enjoy beautiful Lake Norris! Such a great property and great location! Staying at the Lucy was so wonderful! The location is great...so close to Shanghai and Stardust and Sugar Grove Marinas. It was very clean and the neighboring homes were well kept also. There was a nice array of electronics available for those rainy days (roku stick, directTV, etc). We will definitely stay here again! Really clean house. Great for a small family. One of our best lake trips so far. I’m sure we will be back again. I should probably give it a bad review so it’s not overbooked next year. The owner was awesome and very help. Responded quickly. Loving lake life at the Shanghai Lucy! Our family stayed at the Shanghai Lucy in June 2017. We absolutely had the best time! The owner, Mark, was very responsive and addressed the questions we had promptly. The house was perfect, just as advertised. It had all the amenities we needed, including EXCELLENT WiFi! Without the WiFi, we would not have been able to make calls. (Sprint does not have good coverage in the area) The kids enjoyed the bunk room and the master bedroom's bed was very comfortable! We brought down our boat and restaurant hopped from marina to marina. The Shanghai Resort nearby was excellent and easy to get to. The kids kayaked around the floating home neighborhood and were playing in the water from dusk to dawn! We sat on the front porch drinking coffee most mornings watching the ducks swim around. If you are looking for a relaxing lake vacation in the cleanest lake around, the Shanghai Lucy provides wonderful accommodations creating lasting memories! This was our first time staying at a floating house. It was awesome. We kayaked everyday day and swam right off the porch. Owners were great to work with too. Can't wait to rent it again. 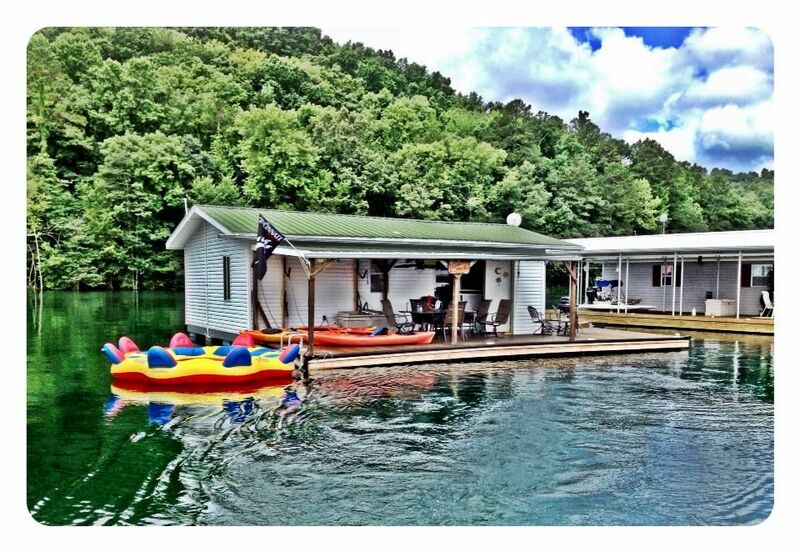 The Shanghai Lucy is a floating house on Norris Lake, with all the fun and beauty associated with Norris. Norris Lake is in the Cumberland Mountains, with many state parks, hiking trails and an excellent trout stream nearby. Great Smoky Mountain National Park, Gatlinburg, and Pigeon Forge are only 1.5 hours away.